"Leningrad" redirects here. For ither uises, see Leningrad (disambiguation). This airticle is aboot the ceety in Roushie. For the ceety in Florida, USA, see St. Petersburg, Florida. For other uses, see Saunt Petersburg (disambiguation). Saunt Petersburg (Roushie: Са́нкт-Петербу́рг (help·info), translit. Sankt-Peterburg, lit. 'ˈsankt pʲɪtʲɪrˈburk') is a ceety an a federal subject (a federal ceety) o Roushie locatit on the Neva River at the heid o the Guwf o Finland on the Easter Seas. The ceety's ither names wis Petrograd (Roushie: Петроград, 1914–1924) an Leningrad (Roushie: Ленинград, 1924–1991). It is aften cawed juist Petersburg (Roushie: Петербург) an is informally kent as Piter (Roushie: Питер). Foondit bi Tsar Peter the Great on 27 Mey 1703, it wis the caipital o the Roushie Empire for mair nor twa hunder years (1713–1728, 1732–1918). Saunt Petersburg ceased bein the caipital in 1918 efter the Roushie Revolution o 1917. It is Roushie's seicont lairgest ceety efter Moscow wi 4.6 million indwallers, an fowert in Europe efter Istanbul, Lunnon an Moscow. Saunt Petersburg is a major European cultural centre, an an important Roushie port on the Easter Seas. Saunt Petersburg is aften describit as the maist Wastren ceety o Roushie. Amang ceeties o the warld wi ower ane million fowk, Saunt Petersburg is the northmaist. The Heestoric Centre o Saunt Petersburg an Related Groups o Monuments constitute a UNESCO Warld Heritage Steid. Saunt Petersburg is an aa hame tae The Hermitage, the lairgest airt museum in the warld. Roushie's poleetical an cultural centre for 200 years, the ceety is whiles referred tae in Roushie as the Northren Caipital. Ower its history it haes been referencit as "the Venice o the north" an the "Northren Palmira" an aw. A lairge nummer o foreign consulates, internaitional corporations, banks an ither businesses are locatit in Saunt Petersburg. Saunt Petersburg is the seicont lairgest ceety in Roushie. Per the 2010 Census, the federal subject's population is 4,879,566, or 3.4% o the tot population o Roushie; up frae 4,661,219 (3.21%) recordit in the 2002 Census, an doun frae 5,023,506 recordit in the 1989 Census. The 2010 Census recordit the ethnic composition as follaes: Roushie 92.5%, Ukrainian 1.5%, Belaroushies 0.9%, Jewish 0.6%, Tatar 0.7%, Uzbek 0.5%, Armenie 0.5%, Azeri 0.4%, Tajik 0.3%, Georgie 0.2%, Moldovan 0.2%, Finns 0.1%. Additionally, 652,827 fowk wur registered frae admeenistrative databases, an coud no declare an ethnicity. It is estimatit that the proportion o ethnicities in this group is the same as that o the declared group. The 20t century saw hectic ups an douns in population. Frae 2.4 million in 1916 it haed droppit tae less nor 740,000 bi 1920 durin the Roushie Revolution an Roushie Ceevil War. The minorities o Germans, Poles, Finns, Estonies an Latvies wur amaist completely transferred frae Leningrad durin the 1930s. Frae 1941 tae the end o 1943, population droppit frae 3 million tae less nor 600,000, as fowk dee'd in battles, starvit tae daith durin the Siege o Leningrad, or wur evacuatit. Efter the siege, some o the evacuees returned, but maist influx wis due tae migration frae ither pairts o the Soviet Union. The ceety absorbit aboot 3 million fowk in the 1950s an grew tae ower 5 million in the 1980s. Frae 1991 tae 2006 the ceety's population decreased tae the 4.6 million, while the suburban population increased due tae privatization o land an massive muive tae suburbs. Based on the 2010 census results the current population is ower 4.8 million. The birth rate remains lawer than the daith rate; fowk ower 65 constitute mair nor twinty percent o the population; an the median age is aboot 40 years. Fowk in urban Saunt Petersburg live maistly in apairtments. Atween 1918 an the 1990s, the Soviets naitionalisit hoosin an forcit residents tae share communal apairtments (kommunalkas). Wi 68% livin in shared flats in the 1930s, Leningrad wis the ceety in the USSR wi the lairgest nummer o kommunalkas. Resettlin residents o kommunalkas is nou on the wey oot, albeit shared apairtments are still no uncommon. As new burghs wur biggit on the ootskirts in the 1950s–1980s, ower hauf a million law income faimilies eventually receivit free apairtments, an aboot an additional hunder thoosan condos wur purchased. While economic an social activity is concentratit in the historic ceety centre, the richest pairt o Saunt Petersburg, maist fowk live in commuter auries. For the first hauf o 2007, the birth rate wis 9.1 per 1000. Saunt Petersburg is a federal subject of Roushie. The poleetical life o Saunt Petersburg is regulatit bi the ceety chairter adoptit bi the ceety legislatur in 1998. The superior executive body is the Saunt Petersburg Ceety Admeenistration, led bi the govrenor (mayor afore 1996). Saunt Petersburg haes a single-chamber legislatur, the Saunt Petersburg Legislative Assembly. Accordin tae the federal law passed in 2004, heids o federal subjects, includin the govrenor o Saint Petersburg, are nominatit bi the Preses o Roushie an approvit bi local legislaturs. If the legislatur disappruives the nominee, it is dissolvit. Saunt Petersburg ceety is currently dividit intae aichteen districts. Saunt Petersburg is an aw the admeenistrative centre o Leningrad Oblast, an o the Northwastren Federal Destrict. The Constitutional Court o Roushie muivit tae Saunt Petersburg frae Moscow in Mey 2008. 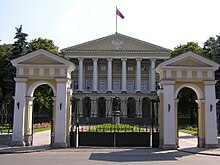 Saunt Petersburg an Leningrad Oblast, bein twa different federal subjects, share a nummer o local depairtments o federal executive agencies an courts, sic as court o arbitration, polis, FSB, postal service, drog enforcement admeenistration, penitentiary service, federal registration service, an ither federal services. ↑ "В первом полугодии продолжалось умеренное повышение числа рождений". Demoscope.ru. Retrieved January 6, 2009. ↑ "The Constitution of the Russian federation". Constitution.ru. Retrieved October 22, 2009. ↑ "Russian source: Charter of Saint Petersburg City". Gov.spb.ru. Retrieved October 22, 2009. ↑ "Official website of the Northwestern Federal District (Russian)". Szfo.ru. June 25, 2009. Retrieved October 22, 2009. ↑ 21.00 21.01 21.02 21.03 21.04 21.05 21.06 21.07 21.08 21.09 21.10 21.11 21.12 21.13 21.14 21.15 21.16 21.17 21.18 21.19 21.20 21.21 21.22 21.23 21.24 21.25 21.26 21.27 21.28 21.29 21.30 21.31 21.32 21.33 21.34 21.35 21.36 21.37 21.38 21.39 21.40 21.41 21.42 21.43 21.44 21.45 21.46 21.47 21.48 21.49 21.50 21.51 21.52 21.53 "Saint Petersburg in figures – International and Interregional Ties". Saint Petersburg City Government. Retrieved March 23, 2008. ↑ "Barcelona's Sister cities". 2008 Ajuntament de Barcelona (City council's webpage). Retrieved December 1, 2008. ↑ "::Bethlehem Municipality::". bethlehem-city.org. Retrieved October 10, 2009. ↑ "Coloful Daegu". Retrieved December 1, 2008. ↑ "Stadt Graz: Sister Cities". Retrieved December 1, 2008. ↑ "Twin Towns – Graz Online – English Version". graz.at. Retrieved January 5, 2010. ↑ "Sister Cities of Istanbul". Retrieved November 2, 2008. ↑ "Le Havre Website – Twin Towns". (in English) 2006–2008 Ovidio Limited. Retrieved November 30, 2008. ↑ "Los Angeles City Council: Sister cities of Los Angeles". Retrieved December 1, 2008. ↑ "Partner Cities of Lyon and Greater Lyon". 2008 Mairie de Lyon. Retrieved October 21, 2008. ↑ "Friendship Agreements". Manchester City Council. Archived frae the oreeginal on June 11, 2008. Retrieved December 1, 2008. ↑ "International relations: Saint Petersburg". Retrieved December 1, 2008. ↑ "City of Melbourne — International relations — Sister cities". City of Melbourne. Retrieved July 7, 2009. ↑ "Milano – Città Gemellate". 2008 Municipality of Milan (Comune di Milano). Retrieved December 5, 2008. ↑ "Official Website of Municipal Corporation of Greater Mumbai". Municipal Corporation of Greater Mumbai. Retrieved December 1, 2008. ↑ "Osaka and the World, the official website of the Osaka city". Retrieved December 1, 2008. ↑ "Paris Partners: 'Les pactes d'amitié et de coopération'". Mairie de Paris. Retrieved December 1, 2008. ↑ "Paris International relations : special partners". Mairie de Paris. Retrieved December 1, 2008. ↑ "Twinning Cities". City of Thessaloniki. Retrieved December 1, 2008. ↑ (in Pols) "Miasta partnerskie Warszawy". um.warszawa.pl. Biuro Promocji Miasta. May 4, 2005. Retrieved August 29, 2008. ↑ "Zagreb Sister Cities". Retrieved December 1, 2008. ↑ "Guide to Vilnuis". Retrieved December 1, 2008. ↑ "Twin cities of Riga". Riga City Council. Retrieved December 1, 2008. ↑ 53.00 53.01 53.02 53.03 53.04 53.05 53.06 53.07 53.08 53.09 53.10 53.11 53.12 "Chairman of the Committee for External Relations of St. Petersburg". Translate.google.com. Retrieved 2012-07-20. ↑ "Online Directory: Russian Federation, Eurasia". Sister Cities International. Retrieved December 1, 2008. ↑ "US Africa Sister Cities Conference" (PDF). U.S. Africa sister cities foundation, inc. Retrieved December 1, 2008. ↑ 58.0 58.1 "Sister cities international". Retrieved December 1, 2008. ↑ "Sister partners of Oslo". Retrieved December 1, 2008. ↑ "Rishon LeZion". Retrieved December 1, 2008. ↑ "The city of Lviv, and its sister cities". Retrieved December 1, 2008. ↑ "Hungary-Russia sister cities". Vengria.ru. Retrieved 2012-07-20. ↑ "Porto Alegre's International Sister Cities Program". Porto Alegre, RS. Retrieved August 22, 2008. Marina Sidyakina (2008-04-10). "Destination: St Petersburg". Helsinki Times. Retrieved 2011-02-09.